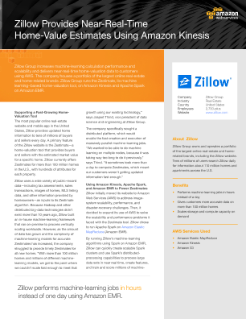 Zillow Group increases machine-learning calculation performance and scalability and delivers near-real-time home-valuation data to customers using AWS. The company houses a portfolio of the largest online real-estate and home-related brands. Zillow Group runs the Zestimate, its machine learning–based home-valuation tool, on Amazon Kinesis and Apache Spark on Amazon EMR.